Are you a funny person in everyday life around friends, family and coworkers? Have you seriously considered taking a shot at stand-up comedy in order to capitalize on your natural comedy talent? Do you feel that you don’t really have all the information you need to know in order to have the best possible chance of success when it comes to becoming a comedian on a professional level? Then I can only strongly recommend that you take the time to check out my new downloadable audio series called Stand-up comedy Secrets For Beginners. And a whole lot more — this series offers 10 hours of fast paced, experienced laced, detailed, no-punches-pulled information that every new comedian should have access to. Let me also say this — the Stand-up Comedy Secrets For Beginners series is the only series of its kind on the planet that provides extensive and comprehensive foundational information specifically geared for new comedians. Knowledge is power. This is especially true when it comes to progressing quickly in the world of stand-up comedy. I can’t begin to describe the insight and knowledge I gained from hosting the Stand-up Comedy Secrets for Beginners audio series. I was often told by my students, I should be performing stand-up comedy. I would acknowledge the thought and discount it due to my fear of public speaking. I could lecture and speak to large groups on almost any subject, but feared giving a speech. I was often asked to speak and would prepare a speech, I would create it, rehearse it, and I would, more often than not, blow the delivery. So taking my “act” on the road so to speak was out of the question. During this series I discovered that my difficulty with getting laughs in the public speaking arena was the same as for most new comedians — I was getting in my own way with preconceived ideas that simply weren’t going to work to begin with. This series allowed me to discover the reason for a lifelong impediment to funny public speaking and I feel confident now, “my getting in my own way”, will no longer be a problem. The self-discovery and unique perspective provided in this series was just mind blowing. Understanding the dynamics, logistics and science of generating audience laughter was captivating. Steve’s point of view and knowledge of stand-up comedy made this series both engaging and entertaining. Trust me, you do not want to pass up this opportunity to learn more about this very fascinating subject. The Stand-up Comedy Secrets For Beginners series consists of 12 downloadable .mp3 audio files. Each episode in the series is 50-52 minutes in duration (there is 10 hours of information provided in this revealing series). Episodes 1 and 2 are available to listen online or download now for free. For $23.99 just $17.99* you can acquire the complete downloadable package (all episodes plus additional free bonus items). *Pricing subject to increase at any time without notice. *A PayPal account is NOT required to securely purchase your downloads. Download links for episodes (any single episode, group of episodes or the complete package) are provided via email upon successful checkout and remain active for 72 hours. Note: There is no mechanism on this site to send you any email except for the email to deliver your free or purchased download links. In other words, you won’t get any additional unwanted email from me as a result of acquiring the episodes you want in this series. The common event that happens in causal conversations that is most closely related to delivering a high impact stand-up comedy routine. Episode purchases are processed securely using PayPal (a PayPal account is not required to checkout). The complete series package is available below the individual series episodes. The 4 main process components comedians use to develop and deliver their stand-up comedy material at a high level. How to easily verify pro comedian performance levels. One important aspects of stand-up comedy that most new comedians miss. The difference between stand-up comedy and acting. About comedy open mics (Part 1). More about comedy open mics (Part 2). One indicator that you are making progress as an open mic comedian. Different types of stand-up comedy material. The advantages of creating and developing topic based stand-up comedy material. Factors that directly impact the speed that a comedian can progress. Audience group dynamics and how they affect a comedian’s performance. The most important audience factors for getting big laughs. The major audience mistake many new comedians make. How comedian videos are different than live performances and why it matters. The performance improvement activity all new comedians should use. Why stage fright presents a major obstacle for comedians. The two major aspects that contribute to stage fright. Hypnotherapy — why it works for some and not for others to get rid of stage fright. How I easily got rid of stage fright for good in just 30 days. Heckling — what it is and why it happens. 3 factors that affect the amount of heckling a comedian experiences. The big secret for reducing heckling. The one thing you do not want to do when dealing with a heckler. The pros and cons of taking a live stand-up comedy class. Considerations when it comes to knowing if your stand-up comedy material is funny before you hit the stage. The impact of the internet on stand-up comedy. The proliferation of “armchair stand-up experts” who have never developed a stand-up comedy act or been on stage as a comedian. What you need to know about joke theft. Why it is usually a bad idea to try to buy jokes for a stand-up comedy routine. Issues with trying to sell jokes/stand-up comedy material to comedians. The different levels comedians progress to. The single most important factor that impacts your progress speed as a comedian. Television appearances and what it can mean to a comedian. How getting “breaks” can affect a comedian’s career (I provide personal examples from my own stand-up comedy career). How the Comedy Evaluator Pro software was developed and what it can do to shave time off the time it takes a comedian to deliver a high level stand-up comedy routine. The two major things a comedian can do to tighten their stand-up comedy routine. Bonus Guide: The Complete Series package includes the new Punchline Secrets Guide ($12.99 value). This detailed 21 page downloadable guide contains the most information available on spoken word punchlines as it relates to you and your unique sense of humor. Click here for more information about this revealing guide. 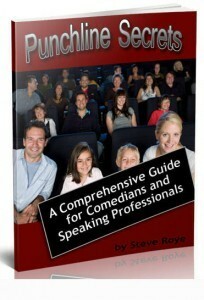 NOTE: The Punchline Secrets Guide also includes a link for an instant discount for the Killer Stand-up Online Course for those who wish to take their comedy talent to a professional level in the fastest time possible. Bonus Audio Interview: This option also includes a detailed 90+ minute interview that I conducted with professional comedian Dave Arena. This particular interview is one of the most revealing and insightful interviews that I have ever conducted with another professional comedian. 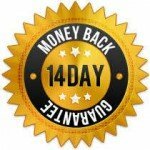 The Complete Stand-up Comedy Secrets for Beginners Audio Series comes with my 14 day, NO RISK, NO QUESTIONS ASKED Money Back Guarantee. If my information doesn’t deliver everything that I have said it would and more, simply email me and I will gladly refund your money — no questions asked. You simply won’t find most of the information provided in this series in ANY of the popular “conventional” stand-up comedy resources available today. End of story. More than anything, I want you to have the fastest possible success that you can as a comedian. And I certainly want this series to have a significant impact in that regard. No matter what, I applaud your efforts to discover what becoming a comedian is really all about and I wish you rapid and rewarding success in your stand-up comedy adventures! P.S. If you know someone who is considering taking a shot at stand-up in the near future, I would very much appreciate it if you would share this page with them. Thanks in advance!